Because of its antiviral properties, an apple a day may actually work to attack common cold viruses. Drinking apple juice or ingesting apple cider vinegar are ways you can fight infections and contribute to your overall good health. Apple cider vinegar is a natural, bacteria-fighting agent that contains a number of essential minerals and trace elements known for fighting off colds and related symptoms. According to the Mayo Clinic, most people can expect to be sick with a cold for at least one to two weeks, but home remedies can temporarily relieve symptoms. Take a teaspoon of apple cider vinegar in 1/3 cup of water twice each day as a preventive measure during the cold and flu season. Vinegar helps the body maintain a proper pH level, as blood pH tends to be more alkaline when a person has a cold. The malic acid in apple cider vinegar also helps to strengthen the immune system, making it more difficult for viruses to invade the body and decreasing the chances of catching a cold. Soak a piece of brown paper in apple cider vinegar as a remedy to help alleviate the symptoms of a chest cold. Sprinkle black pepper on one side of the paper. Place that side on your chest, laying a towel on top of the paper. Leave both the towel and paper in place for about 20 minutes. Black pepper is another powerful antioxidant that can help clear up colds. Add a capful of apple cider vinegar to a bowl filled with steaming water. Breathe in the vapors to help open congested nasal passages. Apple cider vinegar works to thin the mucus, as well as kill viruses and bacteria. Mist a clean cloth with apple cider vinegar and place it on your pillow at bedtime to calm a nighttime cough. You can also mix equal portions of apple cider vinegar and honey to formulate a natural cough syrup. Take two teaspoons. Follow up with another teaspoon in 30 minutes if you are still coughing. Stop the itching of a cold sore. Use a cotton swab to apply full strength vinegar to the affected area several times a day. Although it can sometimes take up to two weeks for a cold sore to go away on its own, apple cider vinegar may speed the healing process. Soothe the discomfort of a sore throat by mixing a teaspoon of apple cider in a glass of warm water. Gargle every hour until your throat begins to feel better. Vinegar is acidic and therefore should be diluted with water. You can also add a pinch of baking soda to reduce acidity before drinking. Add honey to dilute the taste of an apple cider vinegar cold tonic if you find the flavor too bitter. Or add apple cider vinegar to a cup of hot tea or apple juice to make it more palatable. 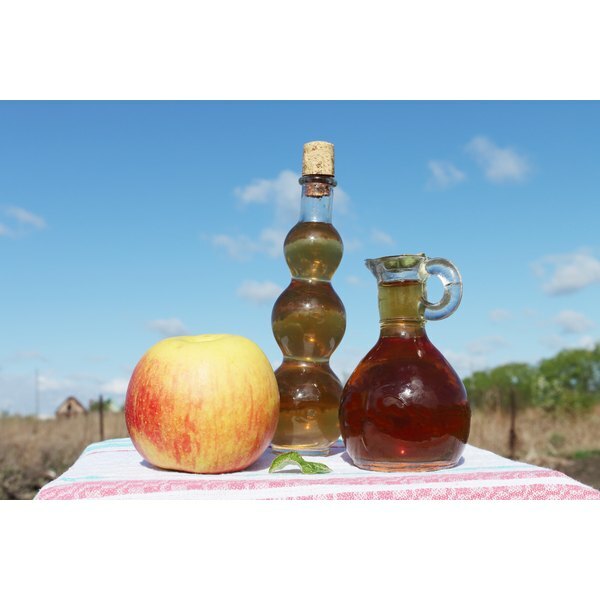 No major side effects of apple cider vinegar remedies are known if they are used in moderation. However, regular use over a long period of time can wear on dental enamel or cause bad breath. Bad breath can be a symptom of acidosis. Taking sodium bicarbonate to reduce acid levels in the blood is usually the treatment for minor cases of acidosis. Contact your doctor if cold or flu symptoms worsen or persist.